If God would have shown you the path he would lead you on over the last 10 years would you have taken it? Before you answer that question think about this one, do you think you’ve been following God’s path? And then there’s this one, how do you know if you’re on God’s path, your own, or someone else’s? If you stop to think about the three questions you’ll discover that by answering the last question first the other two don’t really matter. It is the last question that is really the hardest one to answer truthfully. There are two bible stories that stand out for me that lend themselves to answer the last question for me. The first one is found in chapters 18 and 19 of 1st Kings. Remember Elijah had just proved to all the people God was real? Remember because he defeated the prophets of Baal, Jezebel put a contract out on him? Remember Elijah was disappointed terrified and ran away into the wilderness and quit? Remember an angel fed him, then told him to go to Mount Horeb where God gave him a job to do? We are on God’s Path when he asks to do something for him. Has God given you a job to do? It don’t need to be a huge job, it could be a small as encouraging someone. I remember from my high school electrical science class that electricity always follows the path of least resistance. Wouldn’t it be great if God’s Path always followed the path of least resistance? Was Jesus on the path of least resistance as he made his way to Jerusalem and the cross? For the past 36 years Patti and I have had 36 years of intermittent of long lasting periods of resistance, that doesn’t mean there have not been fun times with little resistance because there has been. But during those times of long lasting periods of resistance the power of the Holy Spirit has gotten us through them. When the Holy Spirit is on the scene you are on God’s Path. And my last biblical story is Peter and his water walk. 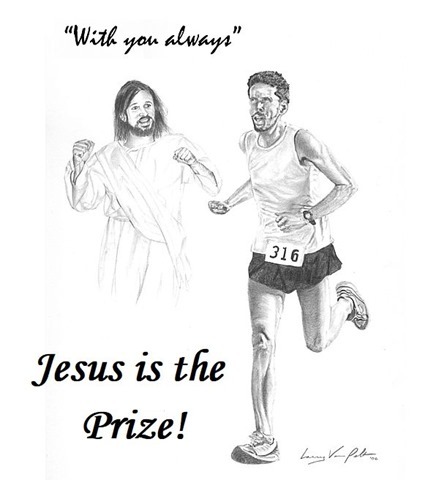 As long as he kept his eyes on the Prize, Jesus, he was on God’s Path but when he took his eyes off Jesus he wandered off God’s Path.